Cheese Bim Bim Bap - better tasting than it sounds. Really. A place I’d really been looking forward to trying was Izakaya Ju. Chicken hearts, cartilage, real coal – so promising! But by the end of the night, all I had was a giant gaping pit of of disappointment. Not-fresh ingredients, poorly prepared items, lacking service, and they still don’t have their liquor license. So at heart, it’s not an Izakaya. Sigh. One more! Sort of. Look for the Fin Izakaya post later this week. Guess the only one of note I haven’t tried is Koyoi, off Yonge St. on Irwin… Any others? Just opened at Elm and Bay — Sushi Queen Izakaya. Serves izakaya menu after 4 p.m. 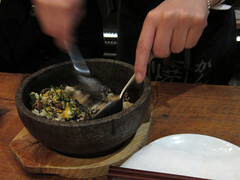 I have been preaching the cheese bibimbop gospel! I loved the dish so much it caused me to rudely interrupt Holt Renfrew’s exec. chef when he suggested that Asian flavours should never have a dairy component. I’ve only had lunch at Koyoi and it was sometime last year! I really have to go back for their nighttime menu but their alcohol menu was pretty expensive from what I recall. That said, their list was fairly extensive when i last checked.